Amateur baking challenge. The five remaining bakers work their way through childhood favourites and delicate french fancies to a mountainous choux pastry masterpiece. 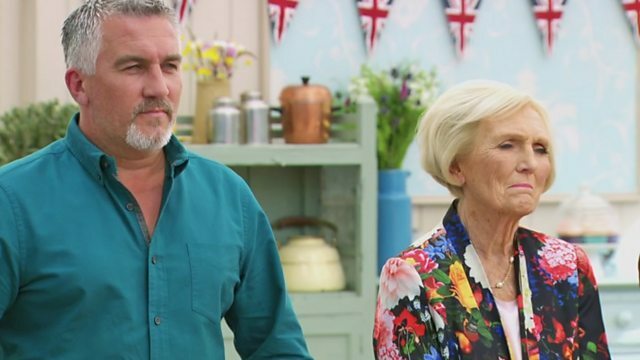 No series of Bake Off would be complete without testing the bakers on patisserie, and what better time to do it than the quarter-finals? The five remaining bakers must work their way through childhood favourites and delicate french fancies to a mountainous choux pastry masterpiece. They start with a brief to create 24 cream horns for the signature challenge. Creating two different flavoured cream horns isn't enough for one ambitious baker, who also makes two different types of pastry, while another hopes to appeal to Paul's inner child by making a banana and custard filling. Mary sets mokatines as the technical challenge, delicate squares of light genoise sponge filled with coffee buttercream and then decorated with two types of icing. It's a fiddly challenge, and Mary and Paul want perfection, but which of our bakers can create cakes worthy of their praise? If ever there was a challenge to define the word show-stopper, then this episode's brief to create a religieuse a l'ancienne is it. Three tiers of choux pastry eclairs filled with creme patissiere, beautifully iced and decorated with buttercream, the religieuse is a marvel to behold, yet leaves the bakers in fear. Time and gravity are against them as they to try create something that looks and tastes amazing and, crucially, stays standing. Find this week's technical and signature bakes on the BBC Food website. "Hunting for the perfect almond"
"It's not over until the big nun sings"